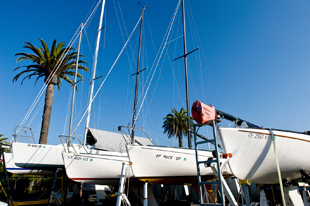 Our dry storage facility can accommodate boats ranging from dinghies to large tailored boats. We offer a 3 ton jib crane for the launching of small boats and sailboats. There is a public launch ramp approximately 1/4 mile away for large power boats. Please contact the harbor master for more information on commercial property or berthing rental availability.